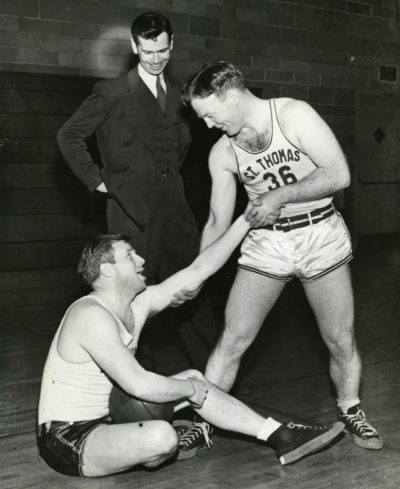 ST. PAUL, Minn. (CNS) — Before John Kundla, who died July 23 at 101, became a Hall of Fame basketball coach with the Minneapolis Lakers, he started his career with Catholic schools. A longtime parishioner of St. Austin Catholic Church in Minneapolis, Kundla first coached and taught at Ascension Catholic School in Minneapolis after graduating from the University of Minnesota in 1939. He moved on to coach boys basketball, baseball and football at DeLaSalle High School in Minneapolis for two years. DeLaSalle won a Catholic league state basketball title during his stint. Kundla then served with the Navy in World War II before his coaching career resumed. He coached men’s basketball at what was then the College of St. Thomas in St. Paul in 1946-47. He also coached baseball and freshman football that year. Kundla went on to become the coach of Minneapolis’ new professional basketball team, which moved from Detroit in 1947. He succeeded as the Lakers’ first coach as his teams won four NBA titles and one in the former Basketball Association of America. That success included a three-peat of NBA titles from 1952 to 1954 led by Hall of Fame players George Mikan and Vern Mikkelsen. When the Lakers moved to Los Angeles in 1960, Kundla opted to keep his family in Minneapolis. He and his wife, Marie, raised six children and were married 67 years until Marie Kundla’s death in 2007. The couple’s son Jack died in 2008. After the Lakers, Kundla continued his coaching as the head men’s basketball coach at the University of Minnesota where he led the Gophers for nine seasons until 1968. He became a member of the Naismith Memorial Basketball Hall of Fame in Springfield, Massachusetts, in 1995. Kundla lived his final years at Catholic Eldercare centers in Minneapolis. He attended daily and Sunday Mass regularly at St. Anthony of Padua, a church adjacent to the Catholic Eldercare’s Albert J. Hofstede Care Center. John Albert Kundla Jr. was born July 3, 1916, in Star Junction, Pennsylvania. His parents were immigrants from Eastern Europe. His father was a coal miner and steelworker. When he was 5, John moved to Minneapolis with his mother. His father was to join the family but never did. As a student at the University of Minnesota, he was a standout player for the Golden Gophers basketball teams of the late 1930s. He is survived by his sons James, David and Tom, daughters Kathleen Dahlman and Karen Rodberg, and six grandchildren.